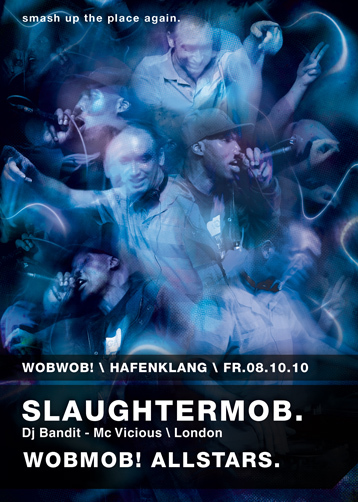 Formed in 1995, brought together by a shared love of the darker side of UK garage, Slaughter Mob are made up of DJ Bandit, MC Vicious aka Nyabingi, MC Dangerous aka Gargamel and Silver Fox formerly known as M Double. Having spent years doing the rounds on Y2Kfm, formerly Mission FM and playing in various venues such as Mass, Bagleyâ€™s, Stratford Rex, Koko and more recently Plastic People they have now developed their inimitable skills to produce their unique sound. Spending time in the studio has enabled them to learn and develop the skills needed to produce tracks as a collective and individually â€“ you only have to listen to SilverFox's "Heeby Jeebiesâ€, Vicious and Banditâ€™s â€œStrange Tensionâ€ or Dangerousâ€™s â€œMurdaâ€ to get a taste of what these bass-heads are capable off. They were residents at the original monthly FWD» night at Plastic People, they've found a home to bring the dastardly S.L.T. sound. A guaranteed show-stopper, rolling dub after dub and never afraid to re-load, they are pure entertainment and pure vibes. Watch out for their new album (hopefully out in September). Und im Goldenen Salon spielt die Clap Yo' Feet Crew.